Sabina Zaccaro interviews SAQUINA MUCAVELE, executive director of MuGeDe - Mulher, Genero e Desenvolvimento (Women, Gender and Development), a non-profit based in Mozambique. ROME, Oct 19 2012 (IPS) - It is a tried and tested truth that when women come together in groups they can address their issues more powerfully than they can as individuals. 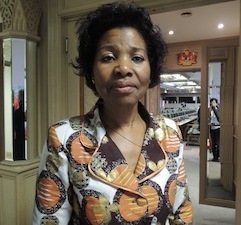 Cooperatives provide a sense of accountability and commitment, as well as healthy competition that brings tangible results, according to Saquina Mucavele, executive director of MuGeDe – Mulher, Genero e Desenvolvimento (Women, Gender and Development), a Mozambique-based non-profit organisation with a focus on sustainability, rural development and gender. Q: How do agricultural cooperatives support female agricultural workers? A: Networks and cooperatives are the right strategy for farmers’ development (provided) they have support and good leadership. Working cooperatively is not only about being involved in common work, it also enables members to share their problems and find collective solutions. There is even the possibility of creating a common market, and other facilities such as hospitals, education centres and banks, for members. By gathering in a cooperative, rural women can strengthen their voice to advocate for rights. Q: What role should men play in this process? A: There is an urgent need to change the attitude and mindset within rural communities, where male dominance prevails in all sectors of development. In agriculture, for example, more resources are allocated to the production of cash crops, an area dominated by men, while women are confined to subsistence farming (with fewer) resources and limited access to markets for their perishable goods. Men should work together with women, recognising that the issue of gender (inequality) affects both men and women, though women feel it more acutely. Men should be fully involved in the goals of reaching sustainable development and reducing gender inequality. Q: According to recent studies, if women are given the tools to increase food production and productivity they can reduce the number of undernourished people in the world by 12 to 17 percent. How can women overcome barriers to resources and land in order to provide more food? A: In order to improve productivity and farming methods, rural women need technical advice, information and training. A good development strategy would recognise the (crucial) role of educating and training rural women to improve production and productivity; promote women-friendly farming technologies that could reduce (the work day) and give women more time for political participation within the community and for other income-generating activities; and institutionalise their involvement and participation in the conception, formulation and planning of policies. They cannot continue to be seen only as ‘beneficiaries’ but a group in possession of (valuable) knowledge that can advance rural development and also contribute to the national economy. Finally, it is vital to support and assist women in the registration of and access to land titles and facilitate the issue of credit, especially for smallholder women farmers. This should (ideally) be done through a fund to support women farmers and the creation of women’s banks in rural areas where members can access credit under favourable terms. Q: Despite the fact that women make up over 75 percent of agricultural workers and livestock-keepers in developing countries and constitute the majority of food producers, processors and marketers in Africa, their role in determining policies in the agricultural sector still remains a minor one. Why? A: (Deep-rooted) cultural perceptions could be one reason. Women’s opinions are not valued and their rights (are seldom) acknowledged. Age-old barriers like the patriarchal system need to be addressed by engaging not only the government but also traditional (village or district) leaders. Another reason is the lack of access and control over land and all productive resources, as well as the fact that the highest rates of illiteracy are among women, particularly rural women. The government should back its agricultural policies with the relevant legal frameworks in support of the development of smallholder women. They should support women’s involvement in the formulation, implementation and review of the budgeting process to ensure that resource allocations are gender responsive. Q: With 35 percent of its households chronically food insecure and 46 percent of all children below fives years malnourished, Mozambique is one of the world’s poorest countries. Do you see Mozambique’s current presidency of the Community of Portuguese Language Countries (CPLP) as an opportunity to advance new actions on food security and hunger? A: Heading the CPLP is a big challenge for Mozambique as it involves (leveraging) existing cultural, political and economic ties in an effort to combat poverty and hunger through the promotion of agriculture, expansion of markets and sharing of information within the community. Our biggest concerns revolve around the implementation of the Regional CPLP Strategy for Food and Nutrition Security and the creation of the Food Security and Nutrition Council (CONSAN), frameworks (designed) to achieve the goal of a world without hunger. There is also the challenge of implementing other regional gender protocols and conventions that have already been signed but not fully implemented, like the Protocol on the Rights of Women in Africa. The CPLP Rural Women’s Forum will advocate for the creation of specific legislation for rural women and their leading role in agriculture.